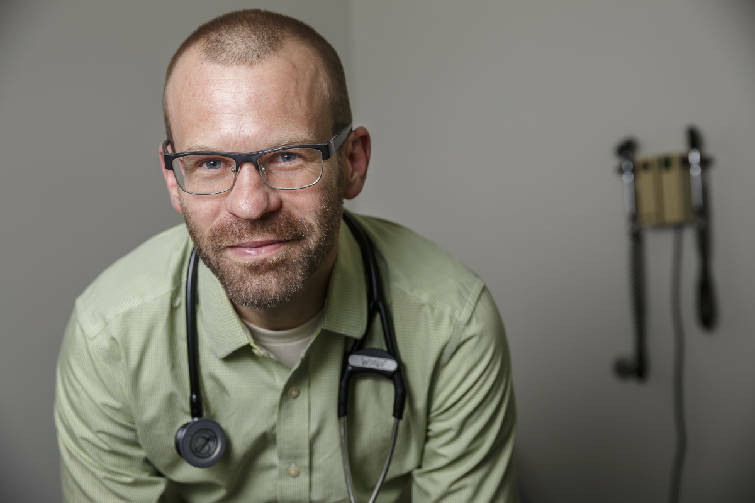 Dr. Matt McClanahan is photographed in an exam room at Integrative Medicine & Associates on Thursday, April 6, 2017, in Chattanooga, Tenn. Dr. McClanahan approaches treating pain as both an psychological and physical issue. POLL: Do you rely on prescription medication for chronic pain? Dr. Matt McClanahan believes the pain you feel in your back may all be in your head. But that doesn't make it any less real. "It's in the nervous system, which does reside in the skull and spinal cord. But your personality, hopes and dreams, if you feel hungry or hot or angry, those are in your head, too," said McClanahan, a pain management specialist at CHI Memorial hospital. "The brain creates many experiences to keep us in balance, such as hunger or thirst. Pain is much more similar to those experiences than it is to a broken bone." "Have you ever felt your phone vibrating in your pocket and checked and discovered that it wasn't?" Dr. Howard Schubiner, director of the Mind-Body Center at St. John Providence Hospital in Michigan, asked attendees at a seminar Friday organized by McClanahan. "Our brains can cause us to believe something is happening physically, but it is not." Schubiner addressed a group of some 100 doctors, nurses, physical therapists and social workers at the meeting, sponsored by CHI Memorial at the downtown Marriott. Too often, McClanahan and Schubiner argue, doctors overlook the mental and emotional components of a patient's pain. "We apply the automotive model to pain," McClanahan said. "'I have a part that is broken, I'm going to go get it fixed.' You can do things to a car that will remedy an issue because it doesn't have thoughts and feelings. You can't do that very well to humans." Pain definitely can have a physical cause, McClanahan said. If you hit your finger with a hammer, the pain is directly tied to the blow, but the brain still controls how it affects you, he said. Athletes or soldiers in combat are often injured and only realize it later, he noted, because the brain has been able to shut out the pain. The brain's ability to cause physical sensations should be obvious, McClanahan said. For example, the rods and cones in our eyes detect light and color, but it is the brain that pulls that data together and combines it with memories into something we call vision. Similarly, the brain can determine how much we are aware of a sensation. When you are talking on the telephone, you are probably not aware of the pressure of your socks on your skin, even though it is there, he said. But if you are told you're in a room infested with fleas and bedbugs, you may begin to itch even though nothing is actually touching your skin. "If you felt you would get ticks now, your brain should turn up the volume on your skin. I would argue that is neurological or psychological. It has to do with the 'volume' — the sensitivity of the brain to skin," he said. McClanahan believes something similar can be at work with chronic pain — the long-term, constant pain that often baffles pain management specialists, because it is hard to find a physical cause, yet leaves patients incapacitated. "Somebody asks me, 'Is the pain just in my head? Do you think I am faking this?' And my answer is absolutely no, no more than faking hunger or itchiness. But that doesn't mean that warning signal is true." Often doctors will find damaged discs in a patient's spine and conclude that is why the patient's back hurts, Schubiner said. Actually, he said, most people over age 50 have damaged discs, and not all of them suffer from back problems. But if patients become convinced their pain is linked to their bad disc, they will focus on trying to stop the pain by fixing the disc even though the actual pain source may lie elsewhere, McClanahan said. Schubiner cited a study showing there is no correlation between patients reporting neck pain from whiplash in a car accident and either the severity of the accident or the apparent injury to the patients. And drivers who participate in demolition derbies, where they repeatedly crash their automobiles and should be at risk of neck injuries, rarely report any problems. But people who are in a wreck often expect they will have pain, Schubiner said. That does not mean they are faking it, but it also does not mean that the pain they feel is linked to a physical injury. Although there is no evidence people today are suffering more traumatic injuries that would cause chronic pain, the use of painkillers has gone up 423 percent over the past decade, Schubiner said. Spinal fusion surgery to treat back pain has increased by 225 percent over the same time period, while more people than ever report they are suffering from chronic pain. In fact, Schubiner said, the amount of money being spent treating chronic pain exceeds that spent on diabetes, cancer, and heart disease combined. But McClanahan and Schubiner argue much of that pain is caused by the brain and not by a broken or injured body part. They both cite studies that show a strong link between chronic pain and emotional distress in childhood, which can continue to show up in adulthood in stressful situations. "Chronic pain is related to emotion," Schubiner said. "When you ask people with chronic back pain to recall a time when they were very angry, their muscles tense up and they have physical pain. There is a connection between our emotions and back pain." "It's knowing that you have had this thing before and it was bad," McClanahan said. "'The surgeon told me it is only a matter of time before I have to have surgery and I don't want it. My uncle had failed surgery. My grandma died on the operating table.' I'm now a victim to my back, the healing response we're all capable of is gone, and we feel stuck." But if it's not something physical causing the pain, then how should doctors or therapists treat it? First, Schubiner and McClanahan said, patients need to be examined thoroughly to be certain there is not a physical cause for their pain. But if nothing shows up, doctors or therapists should search for emotional or stress-related causes. It's important that patients realize their pain may not have a physical cause that results in stress — from worrying about losing a job because of their disability or being criticized by a spouse, or from feelings of failure — but that the stress itself may be a major cause of the pain. McClanahan said he works with patients on ways to reduce that stress and the feelings of powerlessness that often underlie it. "Fear itself can lead to pain," he said. "You get nauseated before an exam, you get tension headaches when you are running late, you vomit before a big game. We will never be as fit as we were in college, we will never have happiness — we get stuck in a loop where the brain feels powerless. It is important to train people in mental, emotional and physiological safety. You can't get out of pain if you think consciously or your brain perceives subconsciously that you are in danger." "That's where this expands to what is going on in your life," he added. "Issues like nutrition, movement, relationships — it involves things from the past that have happened to you, how preoccupied you get about worrying about the future. All of that has consequences."